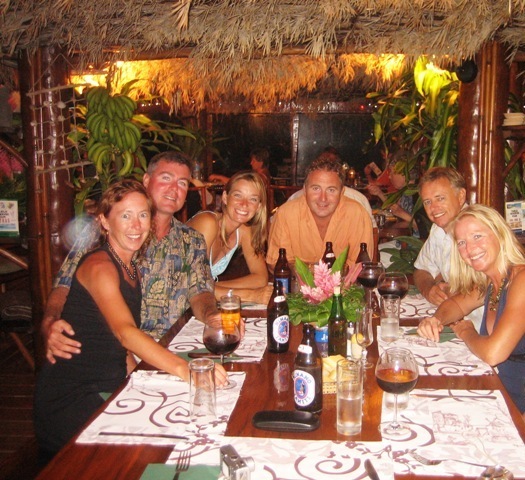 Moorea has a number of pensions and hotels. 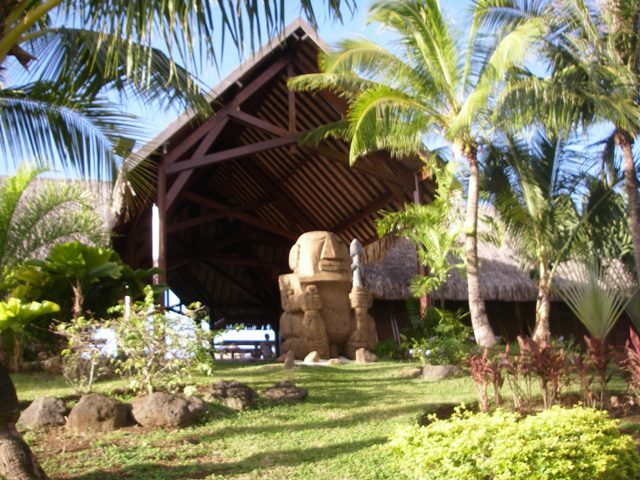 Club Bali Hai in Cook's Bay is one of the oldest. It was started in the sixties by three guys from California...who built the first over-water bungalows...now synonymous with French Polynesia. Once per week they have a traditional dance performance on the lawn with the jagged mountains as a backdrop...breathtaking. Mom, Dad, Chris and I gussied up and headed to the show in Trouble. 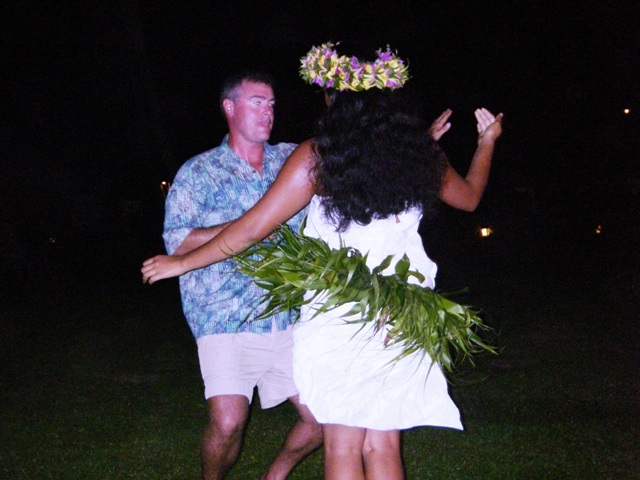 It was a fun night and Chris was even hauled out front for some one-on-one dance instruction...not bad, Chris! Mom and Dad rented a car for a wider range of exploration...the view of both Cook's and Opunohu Bays from Belvedere lookout was awesome. 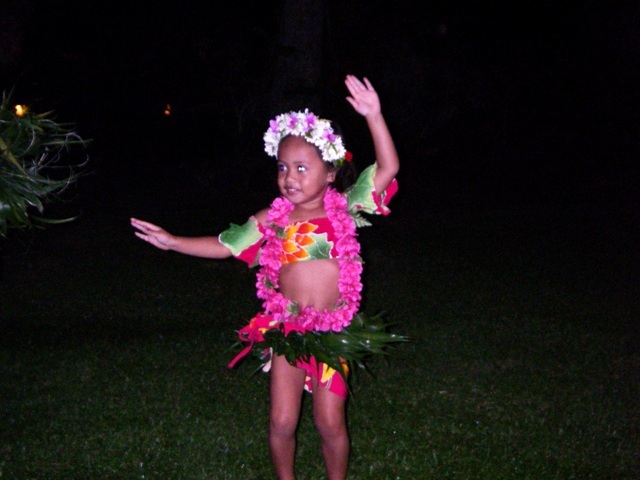 And Erin and Mom took Trouble around the corner to check out the Moorea Pearl Resort and Spa...quite lovely indeed. 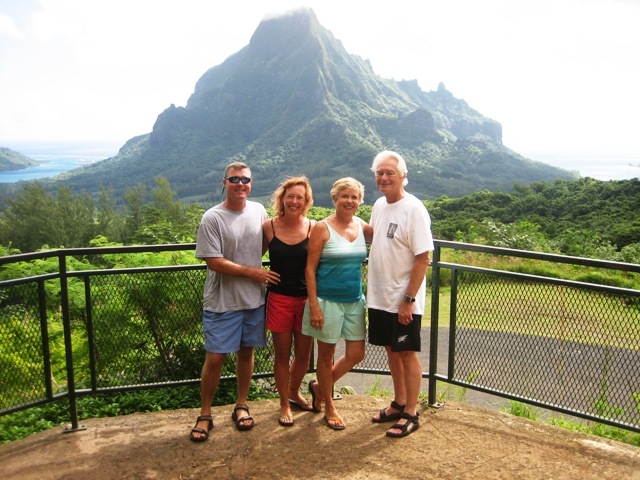 July 19 we pulled the anchor from Cook's Bay on Moorea and headed to Huahine. It was an overnight sail but only approx 90 miles so we left in the afternoon in order to arrive just after sunrise. It was an amazingly calm night...no drama...kudos to Mom and Dad on their first overnight passage. We entered through the Avapehi Pass (600 feet wide and more than 30 feet deep) and continued South to Avea Bay. 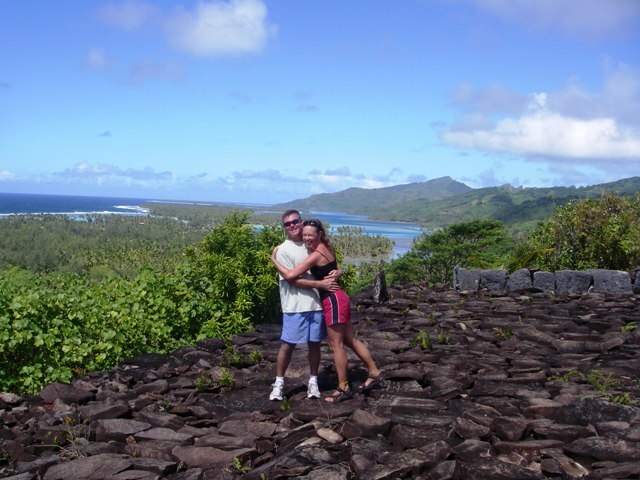 Huahine is made up of two islands created by three volcanoes; Huahine Nui (big Huahine) and Huahine Iti (little Huahine) joined together by a bridge over a channel. 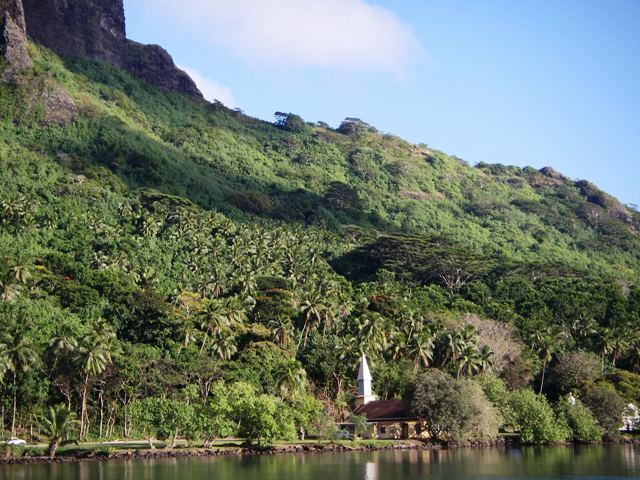 Avea Bay is at the Southern end of Huahine Iti and the most remote part of the island (and has one of the rare white sand beaches). Perfect! We arrived to see several of our friends already anchored...but not yet awake after a full night that kept going way past sundowners. 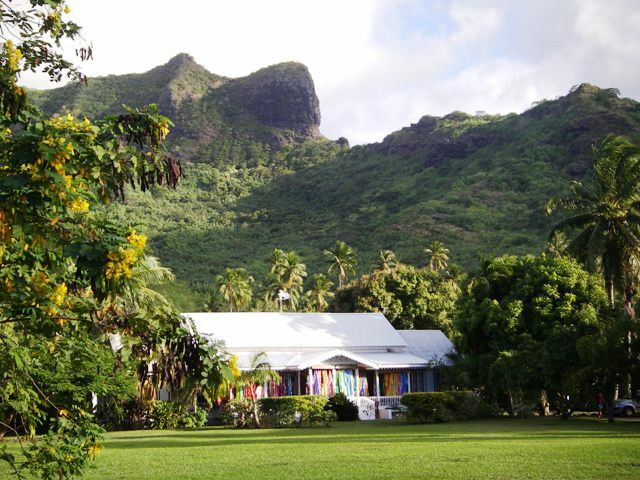 Huahine is often described as what French Polynesia used to be...largely undeveloped land with friendly, charming residents (total population of approx 5600). Drat - just a couple of nights in this bay due to a wind shift...but enough time to have a farewell dinner with s/v Sifar and s/v Serai at Restaurant Mauarii (www.mauarii.com). We are not sure when we will all be together again...maybe Australia or New Zealand...lots of photos taken and toasts made before dragging the dinghies from the beach into the water and back to our respective boats. Due to an increase in wind we decided to move North near the original entry pass for better protection. We anchored in 30 feet of water with a sandy bottom (great holding) just off the main town of Fare. 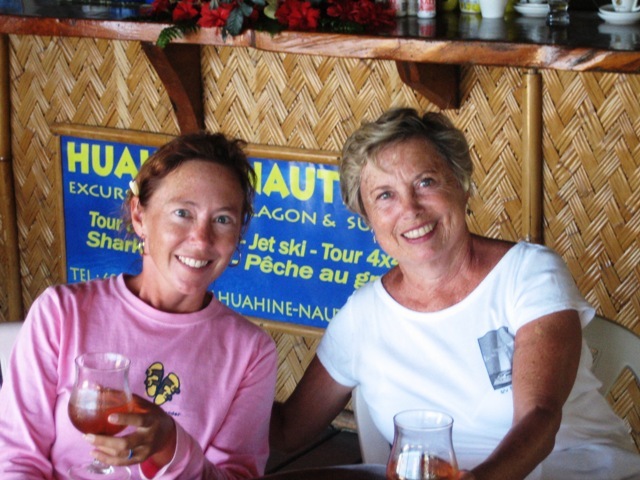 Mom and Dad decided to take a flight from Huahine to Tahiti so we have several days to slowly explore this island and enjoy relaxed sundowners. 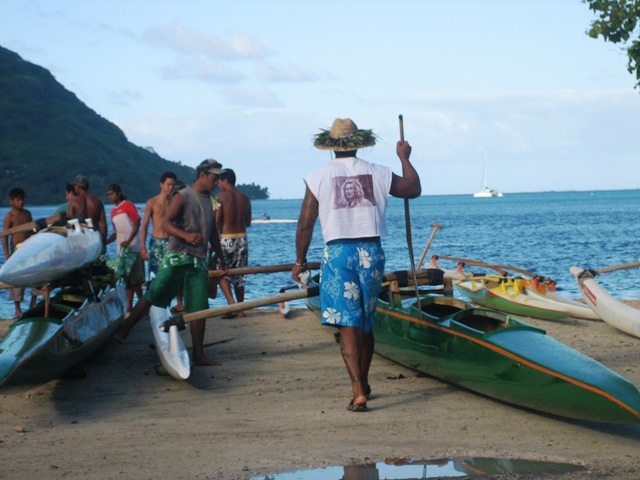 Our first trip ashore and there was a youth outrigger competition. Very exciting...and with as many whoops and hollers as an American football game. Mom and Erin rented bikes and headed to the pearl farm (www.huahinepearlfarm.com). The flat terrain and few cars made it a good ride...with a fun shopping reward at the end. 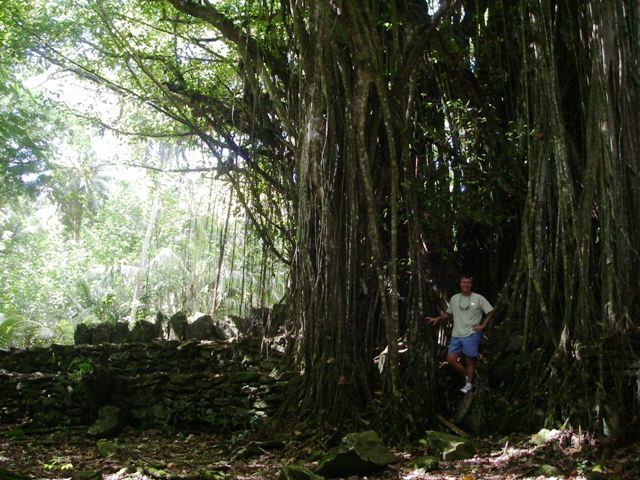 We again saw the abundant French Polynesian vegetation; coconut palms, breadfruit, taro, bananas, yams, cantaloupes, watermelons and many other exotic fruits and flowering trees. Chris and Dad worked on the generator...yes, choices were made voluntarily. 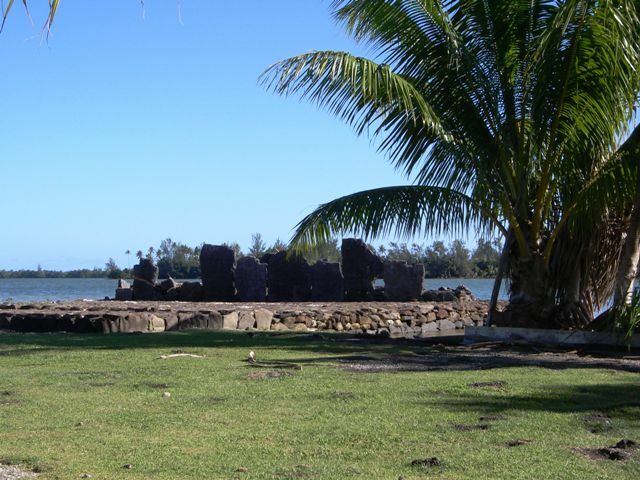 Until we arrived we did not realize that Huahine is archaeologically on par with Easter Island. In order not to miss any of this importance we went for an English language tour with Paul Atallah (pauljatallah@mail.pf). 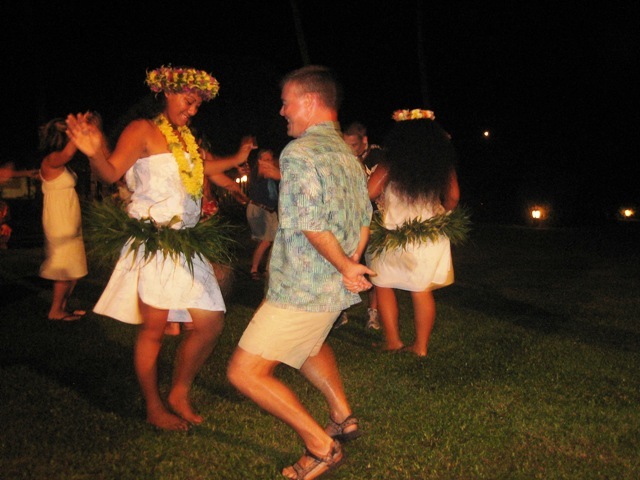 Paul grew up in Manhattan Beach, CA, and graduated from the University of Hawaii with a major in anthropology and a minor in Polynesian Island archaeology. It was a fascinating day! 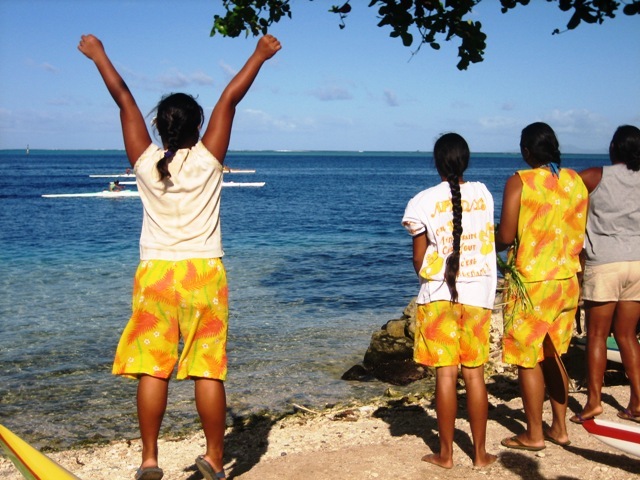 Huahine's history goes back at least 1100 years with seafaring ancestors from Southeast Asia (migration theory of accidental or purposeful still hotly debated). We visited the elaborate and ancient Marae...made exceptionally elaborate due to five royal families living side-by-side (generally only one family is in a single area), ancient fish weirs (fish traps still in use today that use the incoming and outgoing tides to trap the fish) and amazing vistas with Paul narrating the history of the people and agriculture. 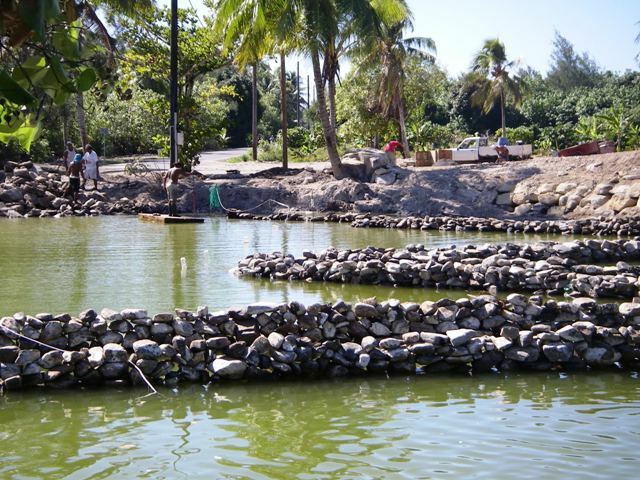 For even more detailed information check out www.opunui.org. 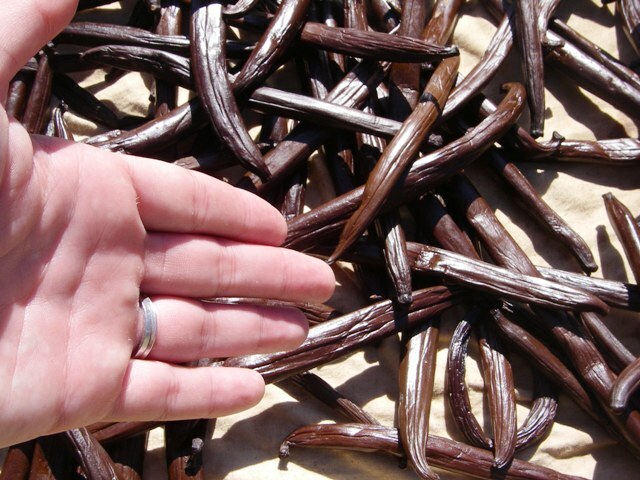 We also visited a vanilla farm. This is a very lengthy and manual process. 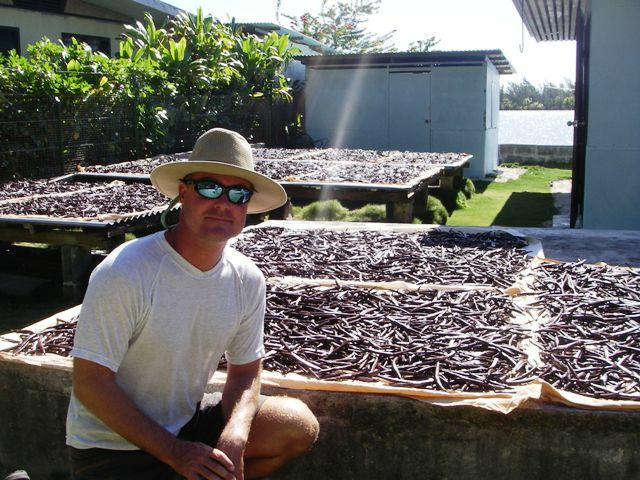 Once picked the vanilla beans are dried daily for only a few hours in the morning...then the process is repeated for several days...but only in the cool hours of the morning. One last food experience before Mom and Dad leave...lunch at a rolouttes. 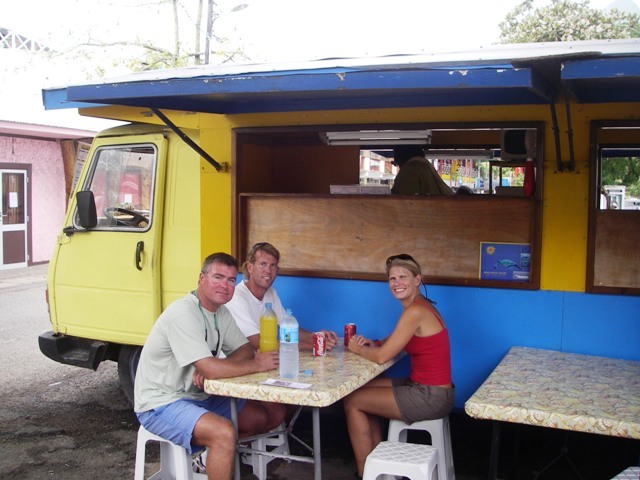 Just a small truck (no - not a roach coach) with a few tables and stools selling basic grilled sandwiches and the regional poisson cru (raw fish). 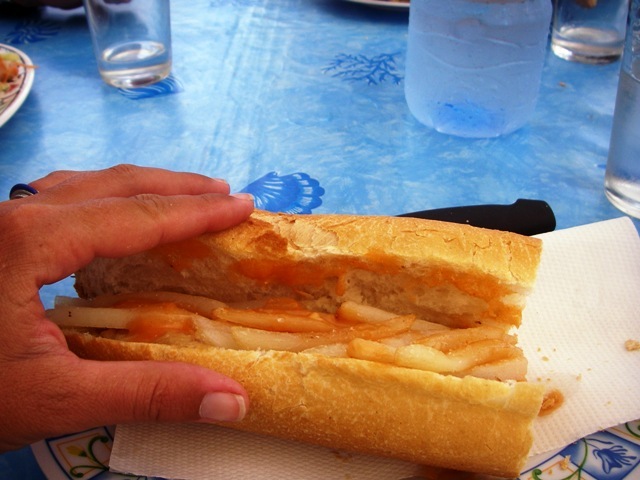 The grilled chicken sandwich is served with french fries and sauce INSIDE the bread - wow - how clever and delicious! 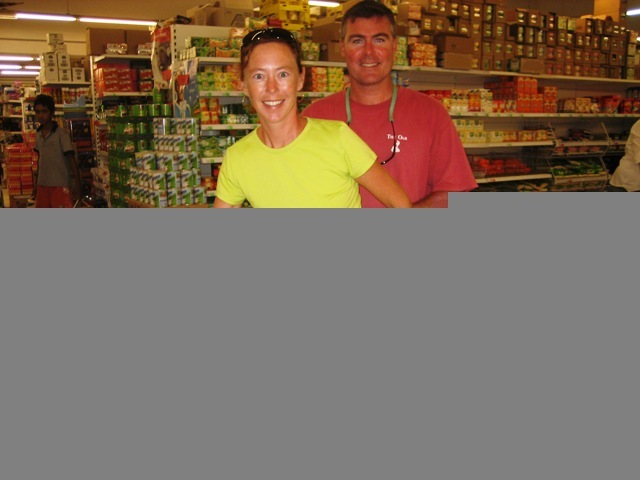 We had many meals aboard because supplies were easy at the local supermarket. It had all you could need...including an entire pig for your next pig roast...literally stem to stern. July 27 we headed into town with Bobby and Suzi of s/v Barraveigh. 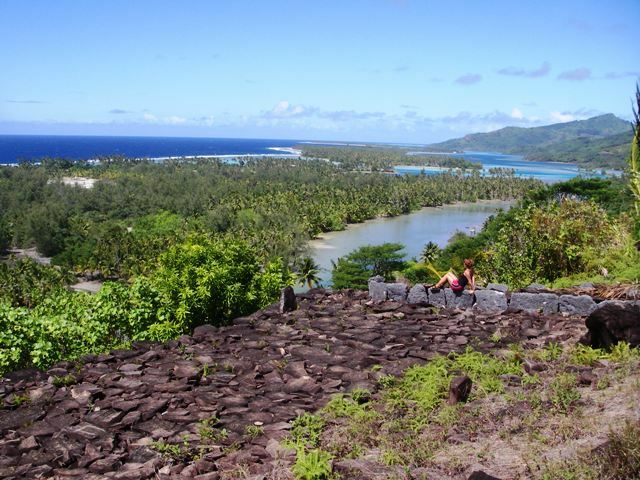 Our goal was to hike the Mata'irea Trail that had been pointed out to us during our tour with Paul. We were slathered with sunscreen and sprayed with bug spray (for the forest bit)...the longest part of the hike was from the dinghy dock to the trailhead. 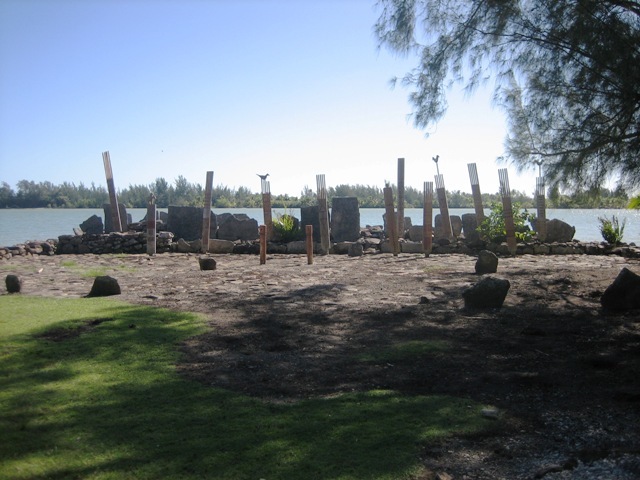 The leisurely trail has remnants of an early Polynesian settlement that winds up to a fern covered plateau overlooking the town of Maeva and its palm-fringed lagoon. The view from the top was spectacular...so many shades of blue water. The walk back was long and we hitched a ride back to town for a roloutte lunch. The winds have stayed strong as predicted...with gusts up to 35 knots which has kept us aboard Barefeet just to be sure the anchor does not drag. Passing rain showers have cleaned the decks and borrowed movies have helped make the days relaxing and fun. 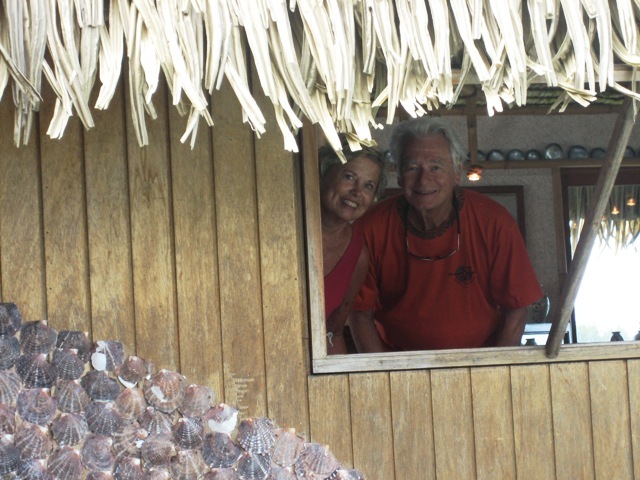 We plan to head over to Raiatea when the winds slack off in order to be hauled out for some bottom cleaning and painting...in the meantime...we keep busy in Huahine snorkeling the nearby coral reef, reading and planning our route to Australia.